Fun day today at the BBL. I mainly wanted to put a post up with my iBike data for those of you curious about the iBike. I’ve highlighted the attack zone data below first – along with a video for the Sterrett attack zone and the Vandiver KOM. I forgot to turn the video back on for the Mimosa attack zone. The format for the post below goes like this: 1) data 2) graph 3) video. Then I’ve got the data and graph for the entire ride at the end. This entry was posted in Training and tagged bbl, ibike, race ride on January 27, 2013 by kartoone. 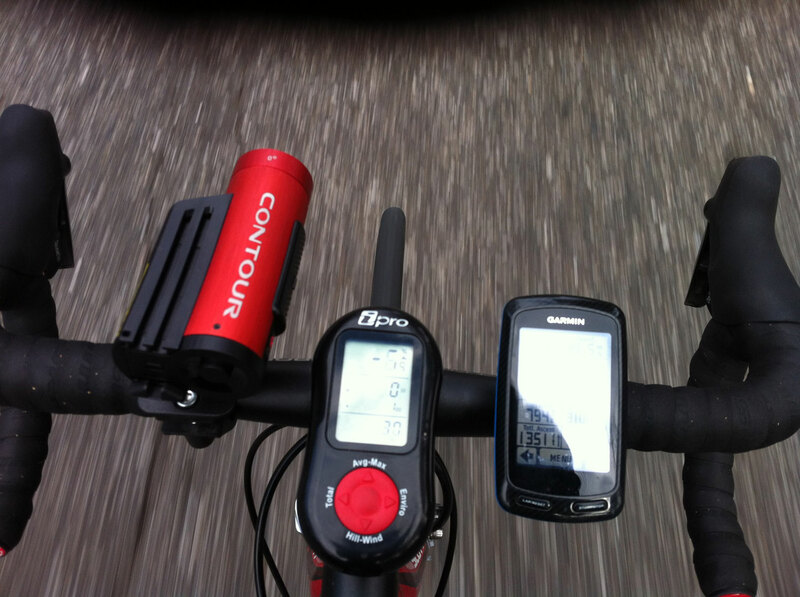 A lot going on in the cockpit … camera, iBike, and Garmin. This is my last week off before the start of the spring semester at Samford, so I wanted to get in at least one more long ride. I’m riding my Scott Addict right now because the Trek is down for the count with a crack in the frame. Because I switched bikes to my Scott, I could re-mount the iBike again (the Bontrager stem on my Trek is far too thick for the iBike mount to fit). The only problem is that when I went to mount the iBike, I discovered I was missing a screw for the mounting bracket … a quick trip to the local hardware store with the iBike and a screwdriver in my back pocket and I was able to find the right screw. In my opinion, the absolute best thing about the iBike is its ability to measure gradients quite accurately — much more so than the barometric pressure calculated gradient from the Garmin. The iBike has an internal gyrometer/accelerometer which can calculate gradient based on immediate changes in pitch, unlike the Garmin which requires motion and change in air pressure to calculate gradient based on the change of elevation over time. The ability of the iBike to measure power is a secondary benefit … and not too bad either compared to all the other power meters I’ve owned. You do have to get it calibrated correctly, but that is a one-time setup step which is supposedly eliminated on the new iBike Newton. Excited about the iBike, I wanted to measure the gradients on the Emerald Lakes climbs which I discovered over Christmas and rode again a couple weeks ago on the way out to Skyball. I’ve posted videos below where I am calling out a small selection of the iBike gradient readings (it updates itself about every second, but I’m only calling out readings every few seconds). The front side climb Cat 4 climb (from the Lake) has the steepest pitch topping out at 30.4%, but the 20+% section is much shorter than the 20+% section on the backside Cat 3 climb. The descent back down the 30% section is dangerous. I was trying to be conservative and still hit 53mph (last video). I’m glad I was trying to be conservative because any faster, and I might very well have ended up IN Emerald Lake. Red tailed hawk flying above its nest in tornado damaged neighborhood. When I was planning out the return route, I noticed that the climb up to the top of the Summit Pointe neighborhood off of Tyler Loop road would probably be an auto-detected Strava cat 4 climb. The picture of the hawk above is just below the summit of the climb. I was trying to maximize climbing on the ride so I created a route through that neighborhood up the climb not realizing that I would be doing the ride on the 1 year anniversary of the Chalkville EF-3 tornado (just under EF-4) which went through a corner of the neighborhood. I came to the realization that it was the 1 year anniversary late in the video below as I was narrating the damage still visible a year later. Click the “youtube” button to watch this on youtube, and you can jump to specific parts of the video using the video bookmarks in the description area below the video. Finally, here is a photoshop – annotated view of the iBike data from the ride. I was concerned with the cold weather that the iBike battery might not make it the entire ride so I cut it off after the Vesclub climb and didn’t turn it back on again until I got up to Trussville. 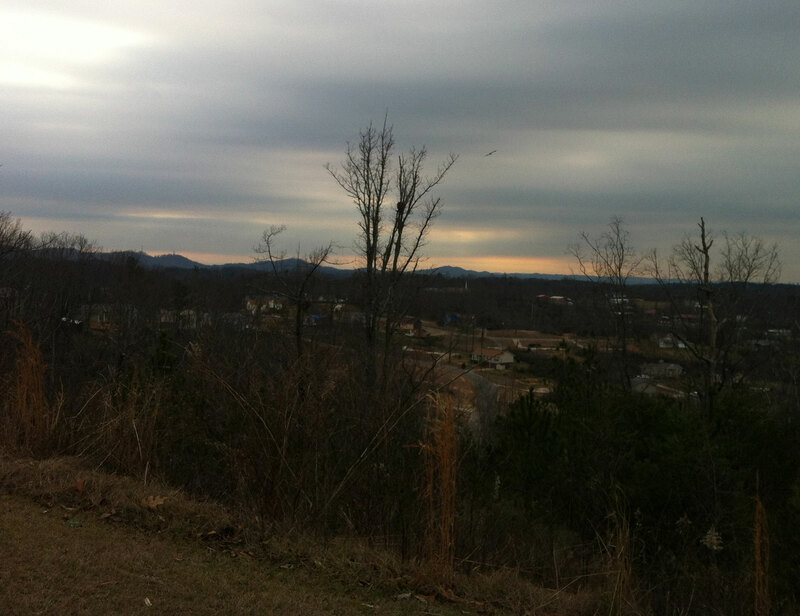 This entry was posted in Training and tagged ibike, long, tornado on January 24, 2013 by kartoone.